Raben Tire will repair a tire if the tire can be safely repaired. Often a tire is not repairable. We follow the Rubber Manufacturers Associations’ guidelines to repairing a tire. Knowing the difference between a proper tire repair and an improper tire repair could be critical to vehicle safety. A tire industry study showed that nearly 88 percent of the tire repairs are performed improperly. An improper tire repair could pose a safety hazard to you and your family and could also affect a tire manufacturer’s warranty. One key process in a proper tire repair is removing a tire from the wheel to inspect any damage that may occur to the inner liner of the tire. A rubber stem, or plug, must be applied to fill the puncture injury and a patch must be applied to seal the inner liner. A common repair unit is a one-piece unit with a stem and patch portion. A plug by itself is an unacceptable repair. 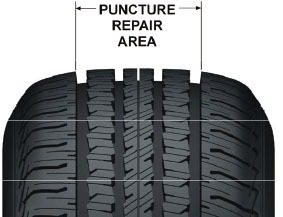 The proper way to have a tire repaired is to patch the tire from the inside and fill the puncture hole. Do not have your tire plugged. Plug repairs do not involve taking the tire off the wheel for a proper inspection. A plug is simply inserted into the punctured area, making it unreliable.